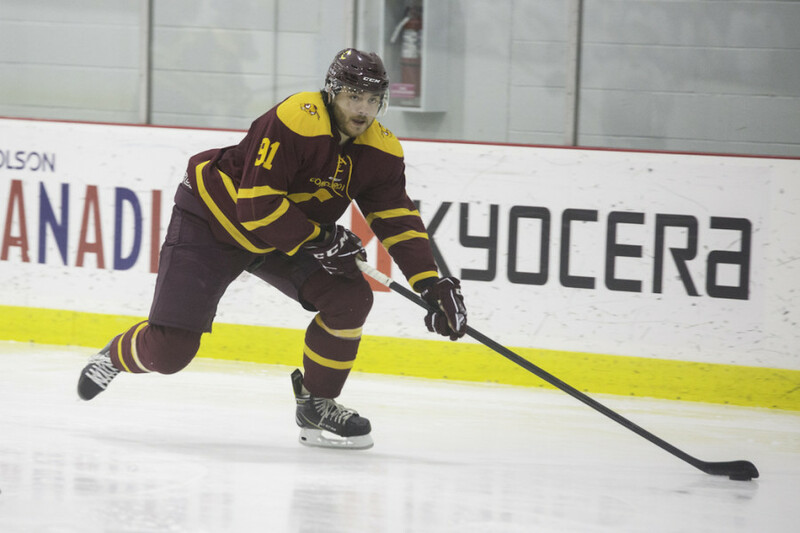 The Stingers men’s hockey team found themselves on the power play late in their Oct. 21 game against the Guelph Gryphons. Concordia was up 2-1 and really needed an insurance goal in order to clinch the win and keep up with McGill in the Ontario University Athletics’ eastern division standings. That was when Stingers’ rookie forward Alexis Pepin made a play. He grabbed the puck, swiftly made his way into the offensive zone, beating one defender as he used his 245 lb. frame to outmuscle another. He picked a spot and fired it past the goaltender for the game-winner. It’s plays like this that show the diversity of Pepin’s skill set. The rookie has been a force early on in the season. Pepin’s ten points in eight games are third best on the team. 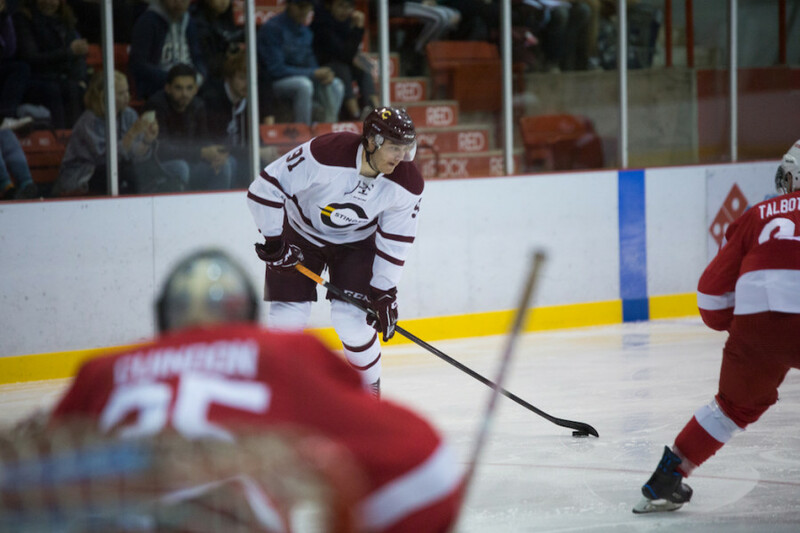 He’s surpassed only by forwards Massimo Carozza, a rookie, and Ontario University Athletics’ leading scorer, Anthony Beauregard. His five goals also sit tied for second on the team. When you see the 6’2, 245 lb. Pepin for the first time, he looks more like a heavyweight boxer than an offensive force on a hockey team. His size and frame make him well suited for contact, allowing him to make space for other players and protecting his teammates. When it comes to Pepin, the two aren’t mutually exclusive. The second overall selection in the 2012 Quebec Major Junior Hockey League draft has found a way to be a presence for the Stingers on and off the scoresheet, playing a physical brand of hockey that packs an offensive punch. The last part is said with a proud smile. As humble as he is and as much as he embraces doing whatever the team needs from him to win, it’s clear Pepin is enjoying putting points up as well. Perhaps the most impressive part of Pepin’s success is the fact that he is doing it as a rookie in a brand new league. Pepin is playing against a different level of competition, now. Opponents are bigger, stronger, and smarter than they were in his junior hockey days. “He’s scoring goals but he’s also working hard. He wants to learn, he wants to get better. It’s fun coaching a guy like that,” notes Element, who calls Pepin a student of the game. Pepin shows no signs of being content to sit on his laurels and appreciate early success either. The former fourth-round draft pick of the Colorado Avalanche is constantly asking Element for video clips to study after games. He is always looking to improve. It’s this kind of attitude mixed with considerable talent that makes Element think that after completing his degree, Pepin will have another shot at the pros. The team’s head scout, Justin Shemie, is of the same mind. In the dressing room, Pepin’s teammates are just as happy to have him on the team as his coach is. Along with his offensive prowess, Pepin makes life easier on the rest of the Stingers, making space in the offensive zone and providing a strong net front presence on the power play. Pepin’s willingness to play roles like this, where he will take plenty of punishment from opposing players and probably be struck by a few misplaced pucks, is just another facet to his game that always puts team first. His career as a Stinger is still only in its infancy. Regardless, he’s put his mark on a team that is thriving and his contributions are certainly appreciated. Element doesn’t plan on letting Pepin’s talent or potential go to waste.